This book develops the idea that since decolonisation, regional patterns of security have become more prominent in international politics. The authors combine an operational theory of regional security with an empirical application across the whole of the international system. Individual chapters cover Africa, the Balkans, CIS Europe, East Asia, EU Europe, the Middle East, North America, South America, and South Asia. The main focus is on the post-Cold War period, but the history of each regional security complex is traced back to its beginnings. 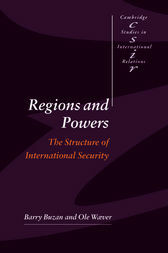 By relating the regional dynamics of security to current debates about the global power structure, the authors unfold a distinctive interpretation of post-Cold War international security, avoiding both the extreme oversimplifications of the unipolar view, and the extreme deterritorialisations of many globalist visions of a new world disorder. Their framework brings out the radical diversity of security dynamics in different parts of the world.